In the summer of 2011, the indigodragonfly group on Ravelry hosted a summer KAL. It was a lot of fun for me as I was a mostly new knitter and had never done one before. I didn’t win the prize for “Most Overcommitted” but I did win the prize for “Best Enabler”. In addition to enabling others, I managed to squeeze in some time to knit a few things for myself, although admittedly far fewer than I had planned. One of them was a lovely cowl from MCN Sport, a most lovely and squooshy DK weight yarn that I have adored ever since, using a Chrissy Prange pattern called “It’s Only Geometry”. I had purchased two skeins of a gorgeous burgundy red called “When I Bit Into Him, I Could Hear The Ocean” (fans of the TV show, “Angel”, will recognize that as a Drusilla quote from the Season 2 episode, “Darla”), and used most of one skein for the cowl. I kept the remaining skein, promising myself I would make gloves from it to go with the cowl. I dutifully put the cowl away in a drawer, so that when the gloves were done, the cowl would be pristine and I could wear them as a pretty set. Fast forward approximately two and a half years…you have three guesses where that second skein of yarn is. Yep…still right where I left it, in my stash. This morning, I felt like wearing red in honour of Chinese New Year, so I went into my drawer and hauled out the cowl and wore it. The yarn has been queued for months now for a pair of fingerless mitts, but maybe I will use it to design my own “matching” pair of mitts. Or maybe, this time next year…the yarn will still be sitting in stash. Yep…that seems a lot more likely. 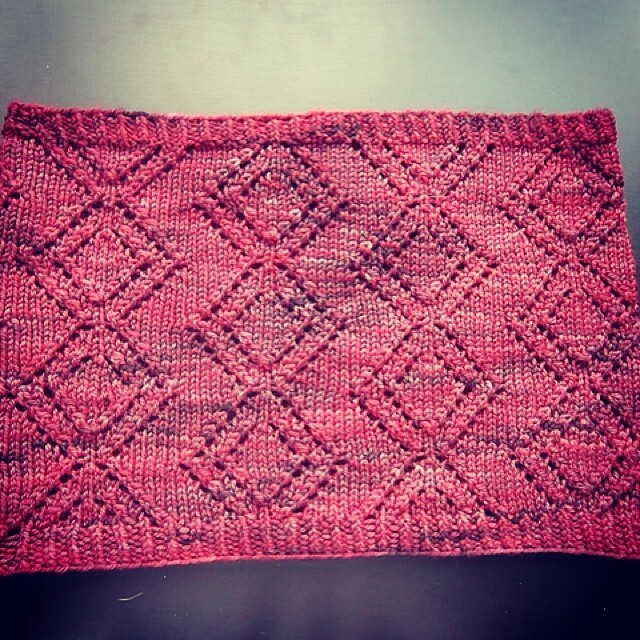 This entry was posted in Uncategorized and tagged chrissy prange, cowl, indigodragonfly, knitting, lace, mcn sport by Rayna. Bookmark the permalink. Send it off to me darlin’ and I will knit you some mitts..
Heh! That’s tempting! I don’t know why I keep putting it off…it’s not at all like it would be a hard thing to do, I am sure.